With a few days to kill, I was hoping for something interesting to come along and give me an excuse to break this cabin fever. It's been a brutal winter here in Michigan. Snow accumulation is making it difficult to get our car to good spots and the cold has been more bone-chilling than I enjoy on a birding trip. Still, I knew I'd be glad to be out if I could just find the motivation to make that first step. 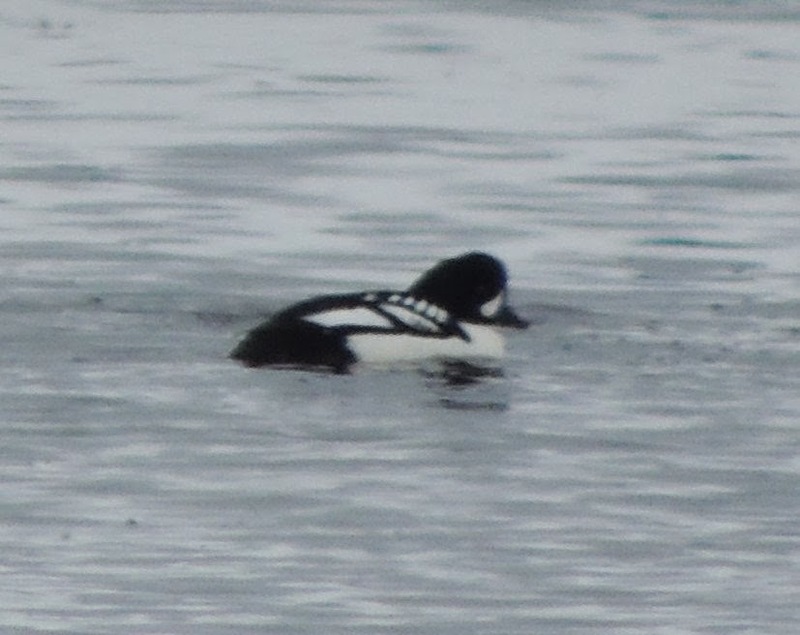 "...observed a Barrow's Goldeneye in the Muskegon Channel...2:45pm..."
Wish granted. That came over the listserv Sunday afternoon from Michael Boston, and he had pics too. Good enough for me. Sarah and I bundled up and headed out the next morning. 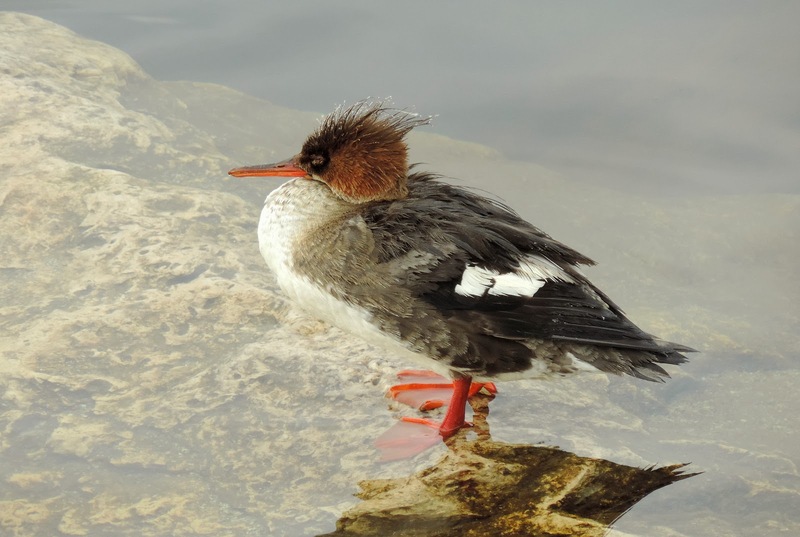 Muskegon is typically a great birding spot in the winter. 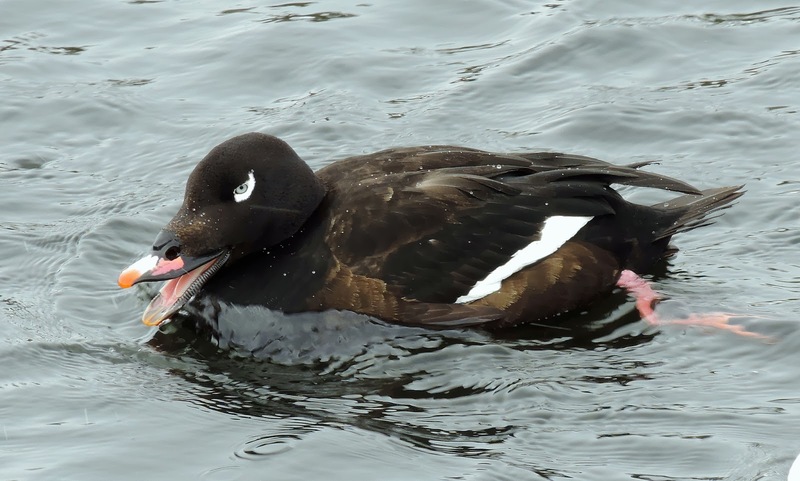 The breakwall at Pere Marquette Park offers good views of loons, grebes, all the scoters, other diving ducks, and often a Purple Sandpiper or three. 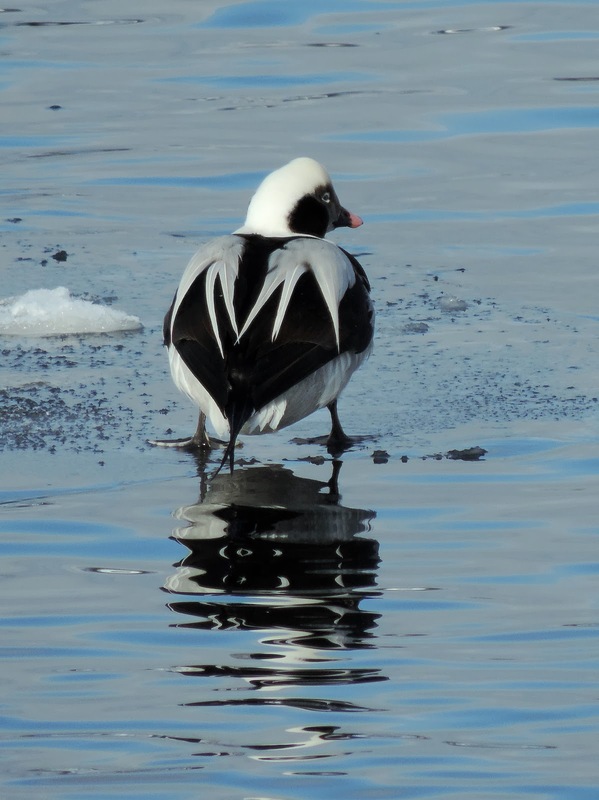 On lucky days a few Long-tailed Ducks might be in the sheltered harbor offering close views from the breakwall. But this winter, that entire area is ice for miles out into Lake Michigan. 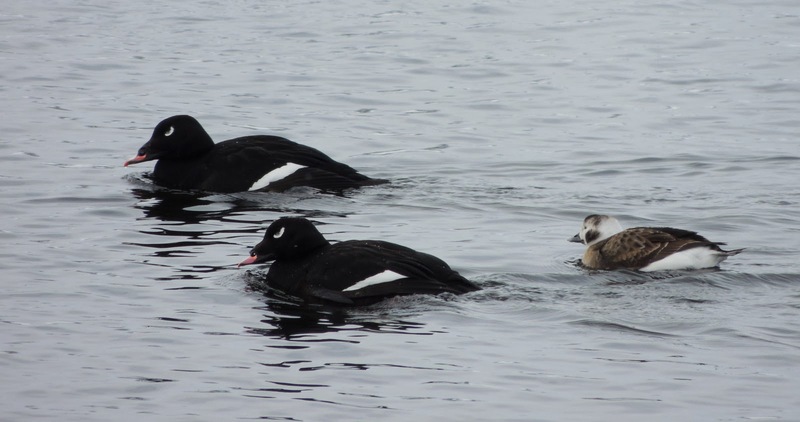 There is very little open water at any of the of harbors on the lake's east shore, so I was surprised to see a picture of a Barrow's Goldeneye along with some Long-tailed Ducks and a scoter or two. Since the Barrow's would be a lifer for both of us, so off we went, looking forward to seeing our first-of-year Long-taileds even if we missed the goldeneye. We parked and noticed the only open water was the narrow channel from Muskegon Lake (a harbor, essentially) out to Lake Michigan. We also noticed thousands of ducks. 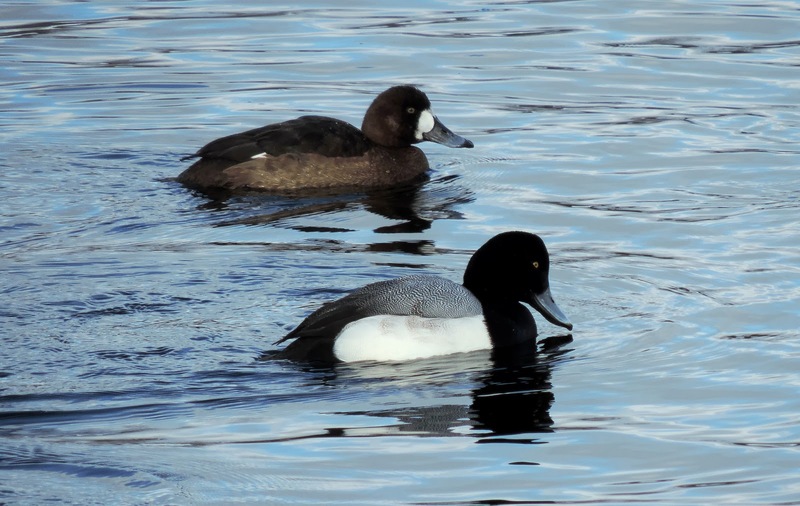 My conservative estimates put the list at 2000 Greater/Lesser Scaup (vast majority were Greater), 800 Long-Tailed Ducks, 500 Common Goldeneyes, 50 Red-breasted Mergansers a couple dozen White-winged Scoters, a few Redheads, and two Mallards. (I actually counted the Mallards, that number is not an estimate.) All of these birds were in a channel maybe 60m across and less than a kilometer long. That was the only open water for miles around, so no one was going anywhere. 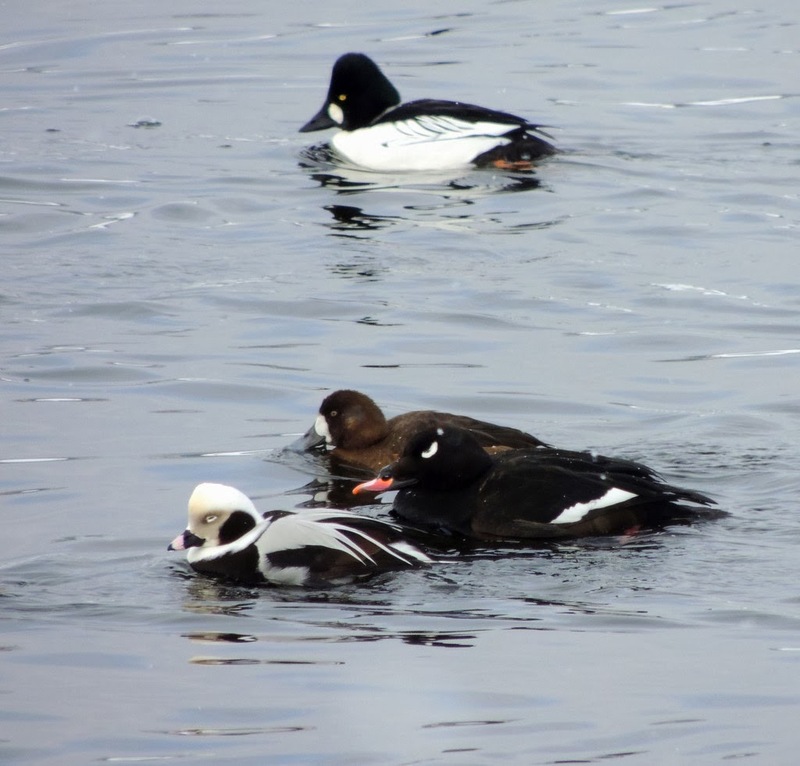 It was also full of fish and, to the delight of the scoters, zebra mussels. Watching the scoters crunching down on a cluster of mussels with their intimidating bills was incredible. 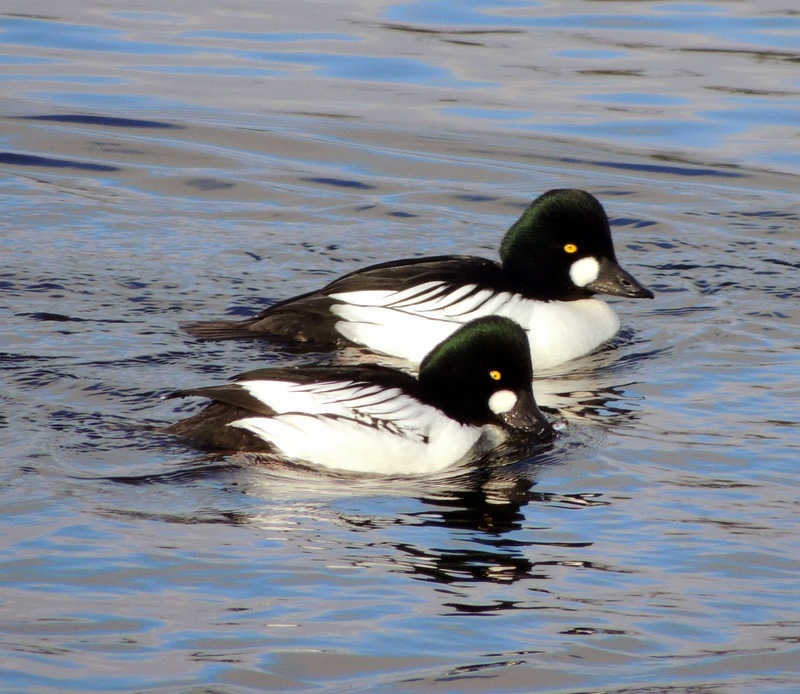 It was also incredible (and I mean that in a bad way this time) trying to spot a Barrow's Goldeneye among the assembled horde of Common Goldeneyes. Some other birds joined us and we all eventually got on the Barrow's, though when he dove and resurfaced in a random floatilla of commons, it took a long time to get back on him again. It was a birding version of that old game whack-a-mole trying to anticipate where he was going to reappear. Sasquatch! But this isn't is a guy in a bigfoot suit, it's really a Barrow's Goldenye...just far away in horrible light. This is not a typical sight 10 yards from shore. It ended up being a great day of duck-watching. 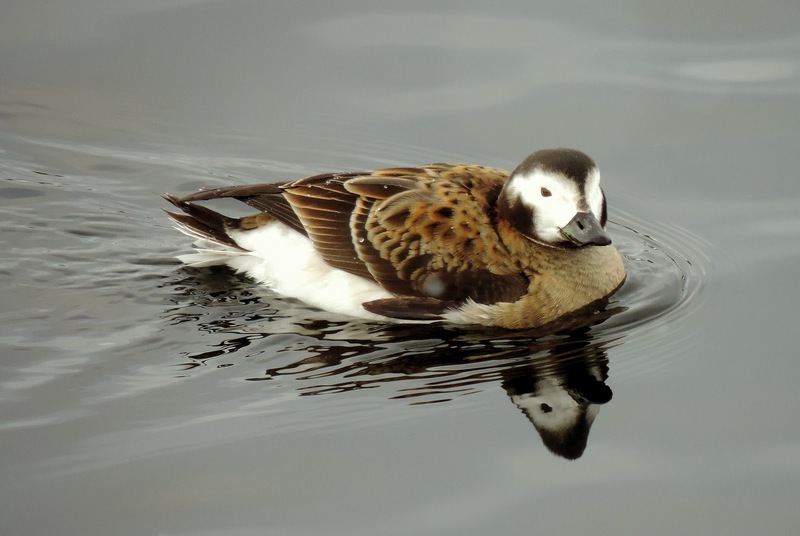 The only thing that could have slightly spoiled it would be getting home and hearing the next day that a King Eider had been found in the channel. I'm glad that didn't happen! Oh, wait...it did. 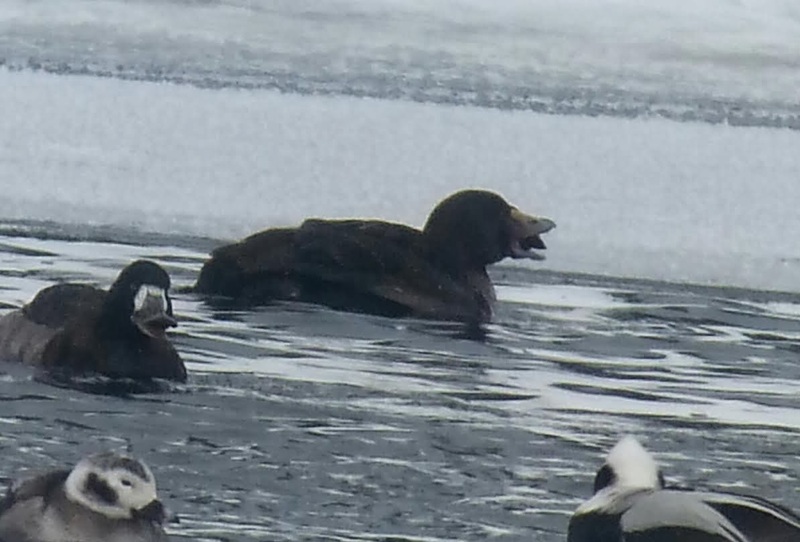 Phone-scoped King Eider ...yes, we went back to get it! 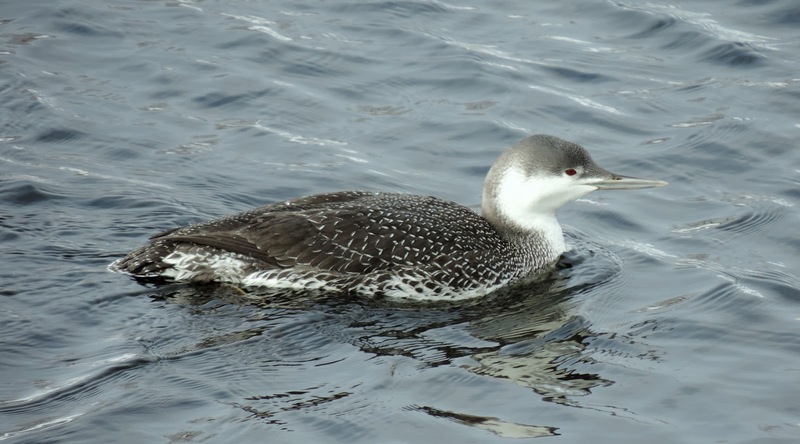 Red-throated Loon was a bonus when we returned for the eider. For more Muskegon and Valentine's Day fun, check out my blog post from a couple years ago. You may notice most of these photos are from my wife who is a better birder, better photographer, and MUCH better looking than I am. Check out her Flickr page. Keep your eyes on all your water holes. Open water on the Great Lakes is going to continue shrinking for a few more weeks and small lakes aren't going to open up very quickly around here. That means you could still get more of these birds arriving down your way. Good luck on the Long-tailed! Seeing scoters crush clumps of mussels makes me really, really, really never want to put my hand in a scoter's mouth. These are some fantastic pictures. I never knew about these ducks -- oh! they all look so adorable and unique -- as if some exotic birds from far-away rainforest. That Scoter really seemed to laugh. 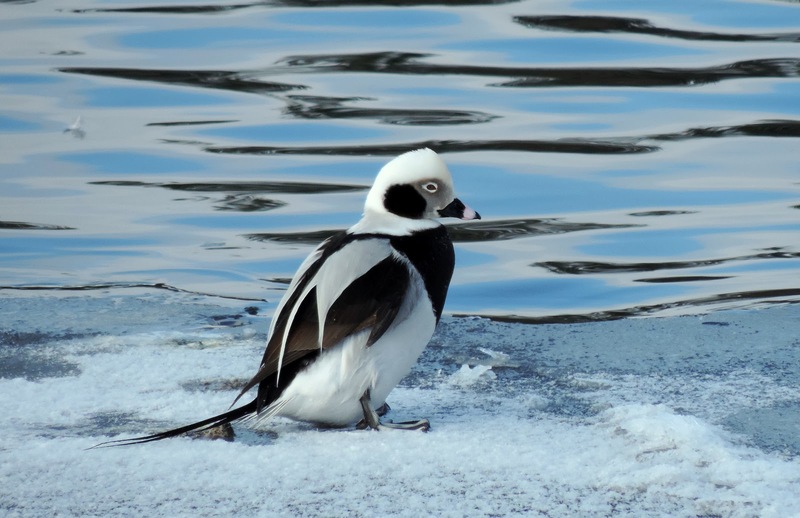 These are some incredible photos of some fantastic winter ducks! 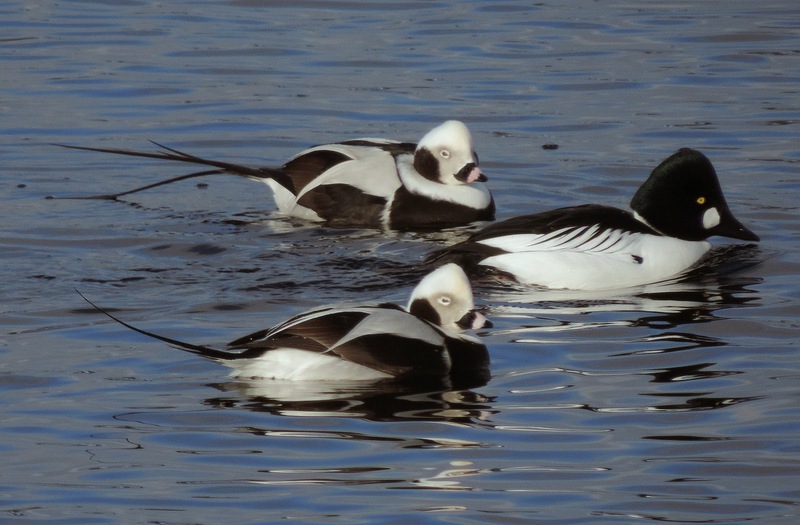 Your experience locating/relocating the Barrow's sounds similar to my recent experience in finding a single Long-tailed Duck amongst a bunch of Common Goldeneyes. I'm jealous you got to see the Long-taileds in such great numbers, and I would love to see a Barrow's and White-winged Scoter some day. Congrats on the lifer! Wow and endless selection of ducks, I love them all!!! What an amazing experience. It must have been a tough winter for a lot of birds. Well done to Sarah too, as its not easy photographing in the cold! Wow--I have never seen so many beautiful ducks before. I will to go duck-watching soon. Honestly these are all amazing shots. Grew up on lake michigan, and never really noticed any of these. They are all beautiful! thanks so much for sharing these wonderful shots! What a fun story and even more fun sightings! You worked hard for your birds this time! p.s. I can't even imagine seeing that many LT ducks! 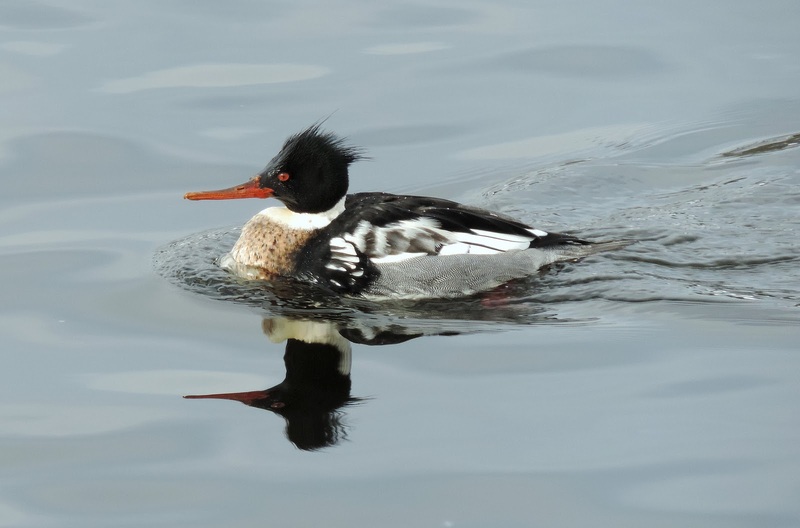 Winter Rarities Keep the Birding Action Hot!